Pham Thi Huan, a farmer from southern’s Vietnam’s Long An province, has helped women farmers in the Mekong Delta adapt to climate change by shifting their production model. Huan has assisted her companions switch to duck raising for egg production and distribution after cultivating rice proved to be difficult due to climate change. Her initiative has not only created jobs, but also improved women farmers’ standing in society. As recognition to her contribution in improving livelihoods, the Food and Agriculture Organization’s (FAO) regional office for Asia and the Pacific will honour Huan on September 17. The award will be presented during a ceremony held in Bangkok to recognise farmers’ achievements under the theme: climate is changing, food and agriculture must too. Interestingly, this is also the theme of the FAO’s annual World Food Day celebrations in the region. Huan will receive the “Model Farmer” award, along with others from Fiji, Mongolia, Pakistan and Thailand. Vietnam is vulnerable to climate change, especially sea level rise. In an interview to Down To Earth, Kundhavi Kadiresan, assistant director-general and regional representative for Asia and the Pacific, FAO, had told that increased scarcity of land, water and labour are serious issues in Asia-Pacific, besides climate change. “…the challenge is particularly important in Asia because more than 60 per cent of the world’s undernourished people live here,” she said. 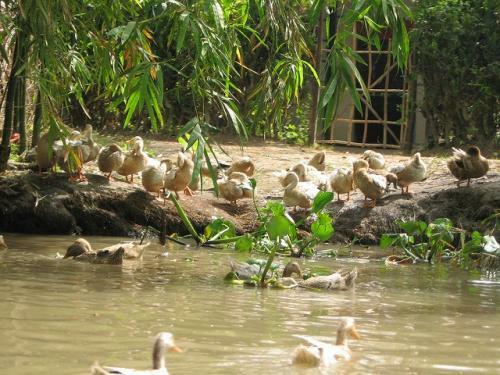 According to a FAO report, fish and duck integration has received considerable attention in Vietnam. In each hectare of swamp, pond or lake about 200–300 ducks can be raised round the year. Fish yield has increased by about 30–40 per cent in comparison with ponds without ducks. The increase has been attributed to duck manure and waste feed which nourishes the water bodies.